2. Open the app and register/login. 3. As soon as a match starts, turn on the live streaming in portrait mode (Don’t go full screen). 4. On the screen, you’ll see Hotstar Watch & Play game (right below the streaming). 5. Now, start answering the question and win various offers on different levels. 6. Click on Claim Prize button once a level is cleared to get the coupon for that offer. Under the Offer, any person who participates in and is declared a winner of the ‘Watch-N-Play’ game, will be able to clip a coupon from Hotstar.com. The Coupon provided to the Game Winner under this Offer will be valid until April 24, 2019. The cashback under this Offer will be provided within 10 days from the date of the transaction using the Eligible Payment Method. Payment for such order to be done using the payment option “Amazon Pay” on BookMyShow. Payment for such order to be done using the payment option “Amazon Pay” on Swiggy. Payment for such order to be done using the payment option “Amazon Pay” on 1mg. Payment for such order to be done using the payment option “Amazon Pay” on Medlife. 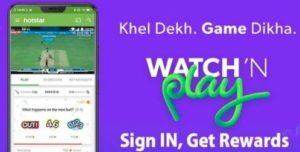 A customer who participates in and is declared a winner of the ‘Watch-N-Play’ game on Hotstar, will get an offer entitling him / her to a flat cashback of Rs 800 for an order placed on MakeMyTrip domestic flights category. Payment for such order to be done using the payment option “Amazon Pay” on MakeMyTrip. A customer who participates in and is declared a winner of the ‘Watch-N-Play’ game on Hotstar, will get an offer entitling him / her to a 25% cashback upto Rs 1000 for an order placed on MakeMyTrip domestic hotels category. Payment for such order to be done using the payment option “Amazon Pay” on Faasos. Payment for such order to be done using the payment option “Amazon Pay” on BEHROUZ BIRYANI. Payment for such order to be done using the payment option “Amazon Pay” on Box8. Payment for such order to be done using the payment option “Amazon Pay” on MojoPizza. Payment for such order to be done using the payment option “Amazon Pay” on Eazydiner. Payment for such order to be done using the payment option “Amazon Pay” on Niki. Payment for such order to be done using the payment option “Amazon Pay” on Haptik. Payment for such order to be done using the payment option “Amazon Pay” on UrbanClap.